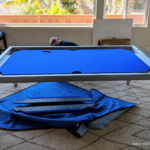 Often, our customers lean toward neutral colors for felt on their pool tables. The Aramith FusionTable is one exception. Due to its modern design and the fact the playing field remains covered by the included dining tops (not shown in these images, sorry), FusionTable owners choose bold colors as a fun design customization. 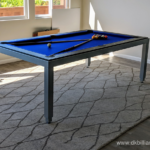 The FusionTable features a modern steel frame to house a slate playing surface. 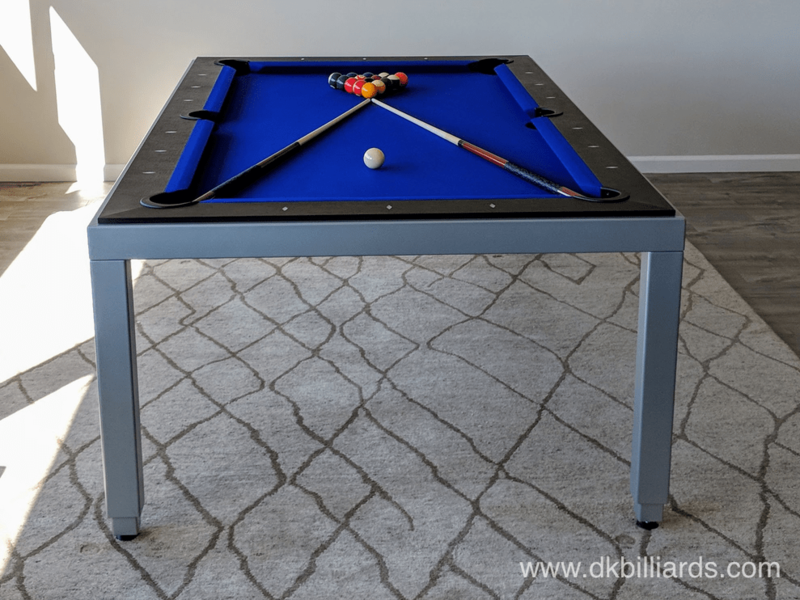 The convertible height disguises this pool table as a super sleek dining table with a couple of quick clicks. Playing equipment stores within the table, out of sight from guests until it is time to play. Installation of this grey steel wenge went without a hitch in a San Diego home. The purple felt takes center-stage in an otherwise grey room. The FusionTable can be customized with different frame and wood options. Visit our Orange County Showroom to view selection.